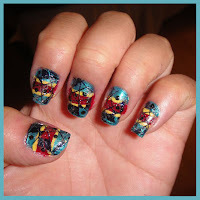 Paint the first third of your nail with the teal nail polish, the second third red and the last third teal again. Wait until your nails dry and use a small brush to paint two parallel yellow lines on where the colours separate. 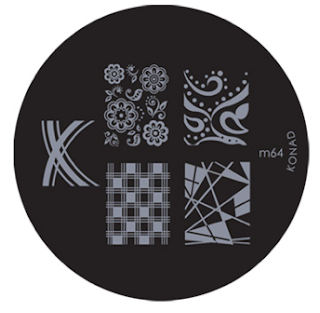 On the M64, coat the image with the Konad special black polish. Scrape the access and transfer it on the stamp and then to your nail. Use a dotter tool, create varying sized dots on areas with a lot of white space. Finally coat your nail with a normal top coat or a glitter top coat like I have done.